The pile group is analyzed using the Finite Element Method. The pile cap is considered as infinitely stiff. A general load is applied in the center of the cap and can be imported from an arbitrary program that performs static analysis. All options require inputting the "Horizontal modulus of subsoil reaction" characterizing the pile behavior in the transverse direction. Floating piles further require determining the stiffness of vertical springs. The program allows for back calculation of this stiffness from the available soil parameters and the typical load. They can be also input directly in the frame "Vertical springs". 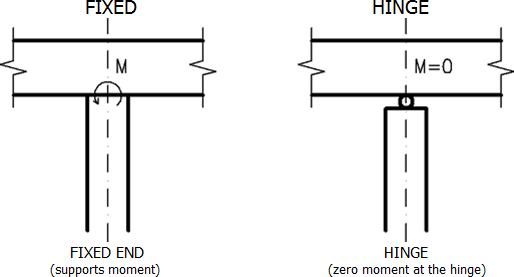 Either hinge or fixed-type connection of a pile to the pile cap can be considered. The own analysis of structure is performed using the finite element method (FEM). Each pile is divided into ten elements. 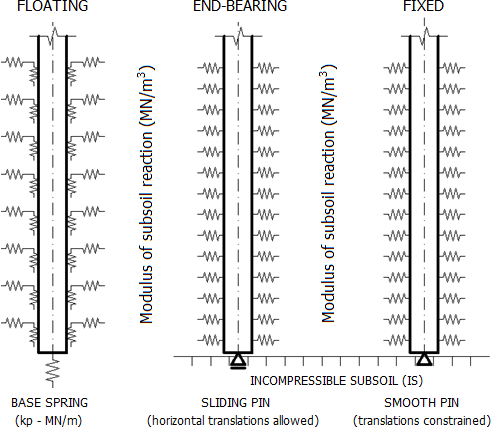 For each element the program defines the magnitude of horizontal and vertical springs. In comparison to an single pile, the stiffness of horizontal and vertical springs are further reduced for both the inner and outer piles - the horizontal stiffness is reduced by the coefficients equal to 0,5 and 0,25 for the outer and inner piles, respectively; the shear stiffness is reduced by the coefficients equal to 0,5 and 0,1 for the outer and inner piles, respectively. These reductions well represent the real behavior of a pile group. The springs at the pile-base are not reduced.